December is upon us and we are on the verge of saying good-bye to 2016. For me, it seems as though we just ushered in the New Year. At this time of the year it’s nice to look back and review our accomplishments and remember the things that did not go as planned. I was raised in a family where resting on your laurels was not encouraged. As such, we smiled when things went well, learned from our mistakes or defeats, and went on to more goal setting. KCPA has set a goal in 2017 to encourage our members to give of their time and talents to help others through a partnership with GBLA. I feel as though our profession has given so much to us and it’s time for us to give back. That can be accomplished in many ways. You can help behind the scenes. The GBLA litigation department is expanding and could use assistance in drafting pleadings. How about leading a 30-40 minute workshop once a month on “How to Probate a Small Estate” or “Bankruptcy” or Tenant’s Rights?” Would you like to assist in court at administrative hearings? If so, the GBLA is seeking advocates in guardianship, domestic violence, eviction defense, and emerging affirmative litigation. There are other options available to you to help in other ways, too. Ms. Adeyinka Glover, Volunteer Attorney Program Coordinator with GBLA, can put you to use if you contact her directly at aglover@gbla.com. When we look back on the year at the end of 2017, it is my hope that we will be able to smile for all that has been accomplished and that some of those accomplishments include helping others through donating your time to the GBLA. I hope you all have a wonderful December, enjoy Christmas and New Year’s, and have many blessings in 2017. 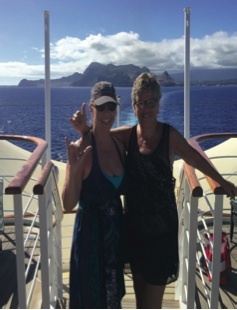 My recent trip to Hawaii with my sister, Janet.